The State of the Union: All you Need to Know About Obama’s Educational Plans in Two Sentences. If there are any cognizant citizens remaining in the United States who do not yet understand that President Barack Obama is utterly incapable of honestly facing the catastrophic reality of his union busting educational policy, or that our president remains wholly beholden to plutocrats like Bill Gates and shysters like Jeb Bush who have been allowed to dictate the policies currently undermining our public school system, or that the man in the White House remains impervious to if not outright contemptuous of the cries of parents and teachers across the country as to the price of the above on their children and students, let such persons ponder for a moment the following two sentences from Obama’s 2014 State of the Union Address. 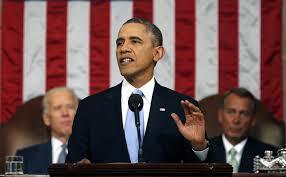 The “coalition of elected officials, business leaders, and philanthropists” that Obama deceitfully promises to “pull together” has not only been together but have been in complete control of educational policy for at least a decade. What other nation would allow educational policy to be formed by politicians, business leaders and philanthropists is beyond me yet, it’s been done now here for so long the dreadful notion is taking intellectual squatters rights. In that time they have been busy privatizing the public school system, monitarizing and quantifying every aspect of education that can be reduced to such, and marginalizing everything else. Their latest project of the “coalition of elected officials, business leaders, and philanthropists” is the creation an immense taxpayer funded data mining system designed to accumulate information on every student in America, the better, somehow, to serve their needs. Note well that Obama’s “coalition” completely excludes both teachers and parents. To dignify this collection of vandals and predators by linking them to the creation of and access to something as necessary and high minded, as high-quality pre-K is beyond cynical. It is a defiant promise that, under this administration, what has been will continue to be and it will be deepened and widened. Those who have ruled the roost will continue to do so, the people and democracy be damned. Unless, that is, we stop them. But how to do so in a nation where traditional politics are broken and traditional political solutions are meaningless? Remember the man who spoke the above words is a liberal Democrat. We face a power that is virtually unprecedented in American history, quite possibly in world history. Never before has such a concentration private wealth, and corporate power and political power been aligned together for the purpose of asphyxiating a vital public institution — the education system — in order to privatize it. Unprecedented concentrations of power demand an unprecedented response. As I see it the only hope we have is to build a coalition of our own, the likes and breadth of which have never before been seen in this country. Something that transcends race, class, creed, all. Something like Occupy but nationwide and sustained. I don’t pretend to know how that is done but know in my bones it must be. I pray we have the wisdom and the wherewithal to understand the forces arrayed against their designs for us and for our children. If not, we are condemning ourselves and our children to a future of a horrifyingly efficient soulless corporate techopoly. 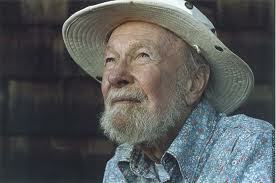 For over six decades Pete Seeger embodied the very best of the human spirit: courage, creativity, integrity and undying compassion. Beginning with my earliest memories, Seeger was a presence, somehow, in every home I’ve ever had anywhere I’ve ever been: a presence, somehow, that reminded one of beauty, yes, but also of duty and responsibility and of the fact that, even in our isolation, we are not alone. Rest in peace, noble and fearless soul. And thank you for all you brought us. On this day in which we honor the extraordinary and exemplary life of Dr. Martin Luther King Jr., we do well to remember not merely his courage and brilliance, his sublime speeches and prophetic visions, but also how King was completely rooted in practical, day-to-day realities. We do well to remember where he was and what he was doing in Memphis, Tennessee on April 4th 1968 where he encountered death in that peculiar American figure of the Lone Assassin. We do well to remember that this world famous Noble Peace Prize winner went to in Memphis, not once but twice, against the counsel of his advisers to support striking sanitation workers and bring attention to the brutal conditions under which the men toiled and under which one had died only days before. We do well, that is, to remember that Martin Luther King was no mere dreamer but a visionary completely grounded in reality, completely aware and utterly appalled by what the poor of all races and creeds were up against and why. We do well to remember this for we are unlikely to hear of this aspect of King from the self congratulatory corporate media who please themselves by insinuating that the Dreamer’s Dream has been fulfilled with the election of Barack Obama, even in this time of greater and greater incarceration rates for African Americans and ever expanding and ever deepening poverty for almost all; even in this age in which 1% of the people somehow own 40% of the nation’s wealth and who literally grow richer and richer by the minute; even as these same forces use their limitless fortunes to remake our world in their image. 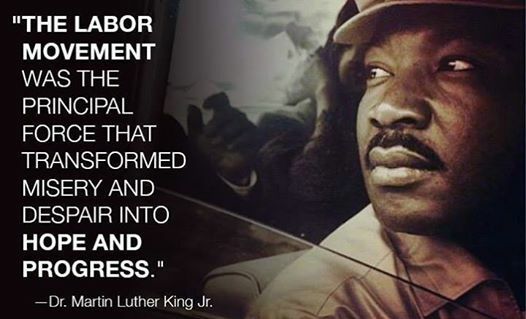 We do well to remember in this era of ALEC and Citizens United and an ever more naked plutocracy eradicating the remnants of our democracy, that Martin Luther King was a tireless and fearless supporter of unions. He was this because he knew that without unions, the working people who created the wealth of the nation were powerless. He knew too that there was a class of people whose notion of freedom was bound up in possessing the legal right to employ the machinery of the state to keep working people permanently powerless. 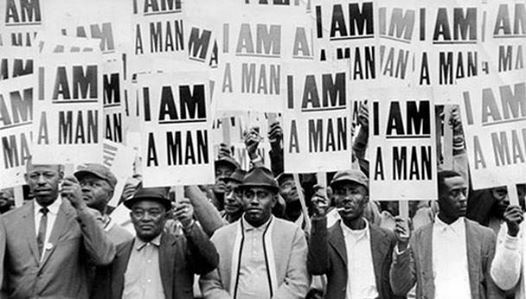 King also knew that with unions came economic justice and dignity. 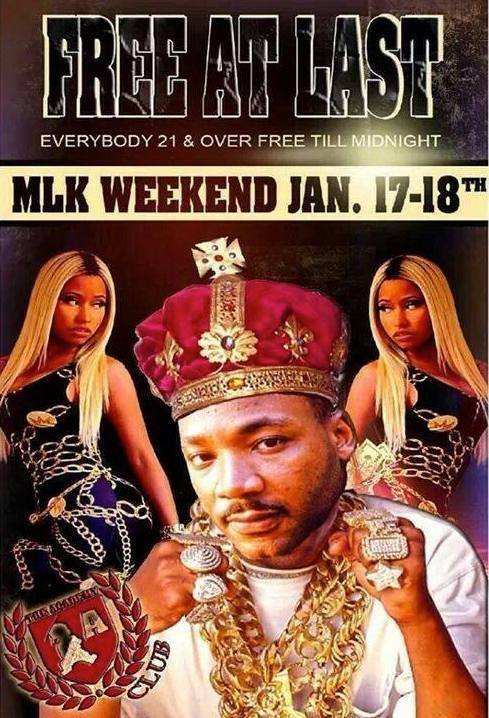 King literally died attempting to bring that struggle to light. We do well, very well to remember this today. Above you will find the most vulgar and repugnant example of this terrible truth than I’ve seen in a while. I am confident that as things go on, the future will bring something even more vulgar and more repugnant for the simple reason that there is nothing in our present world powerful enough to stop it. Gov. George Wallace standing in the schoolhouse doorway not unlike how racists of today stand in the doorways of charter schools. Given the horrific history of race relations in the United States and our continued collective struggle to come to terms with this essential issue, of all the low life angles taken by corporate education reformers and their allies in government, none is lower and more repugnant than their calculated usurpation of the language and iconography of the blood stained civil rights movement. Arne Duncan began by braying on and on about how education is “the civil rights issue of our time ” ever since Obama installed him on his throne at the Department of Education in 2009. Duncan’s multi-millionaire hedge fund manager pals and the chorus of tax exempt-non-profit-organization warriors have been echoing the line ever since. And they have been doing so with absolute impunity. New Yorkers were treated to a variation of this theme just a few weeks ago during Commissioner John King’s “forum” in Brooklyn, where well fed, middle class white operatives of Michelle Rhee’s StudentFirstNY organization earned their pay by insinuating, when not our right declaring, that opposition to the Common Core State Standards was somehow depriving the African American children of Brooklyn their civil rights. The corporate ed reformers and their allies have been repeating the line for so long they seem to be utterly oblivious to how offensive they are. Consider the language and imagery of House Majority Leader Eric Cantor in his speech at the Brookings Institute in Washington on Wednesday in his simultaneous defense of school “choice” and attack on Mayor Bill de Blasio’s plan to make charter schools pay rent. As they are an allusion to one of the more repugnant if horrifically powerful images of the Civil Rights struggle, the words “ no one from the government stands in the school house door” leapt out at me and hit me like a hammer. And I suspect they did so to many with even a cursory knowledge of a time, not so long ago, when the power of the state was arrayed to uphold outright, undisguised, naked racism. There is but one infamous “ stand in a schoolhouse door” moment in American history and Cantor, though a moral ignoramus, has to know this. 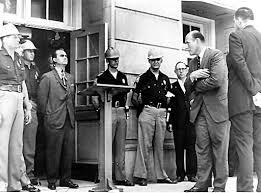 The stand in the schoolhouse door was made at the University of Alabama by proto-Tea Partier, segregationist Governor George Wallace on June 11, 1963. Wallace’s stand was a symbolic gesture in a failed attempt to block the entry of two black students, Vivian Malone Jones and James Hood, into the university. The image made Wallace nationally famous, or infamous, overnight. Exactly as he knew it would. It’s hard to believe that Cantor stumbled upon his choice of an image innocently. It is simply too loaded for that. And it is simply to powerful. And it’s hard to forgive someone who would use such words and such an image to implicitly link people like de Blasio or, by extension, anyone who opposes charter schools, with figures like George Wallace and his repugnant politics. But that is exactly why such words and the images they conjure up are used. Someday, and hopefully soon, someone will write the comprehensive history of the corporate reform campaign and their ruthless and insidious campaign to privatize the American public school system. When that happens, there should be a chapter devoted exclusively to the wholesale usurpation and manipulation of the language and images of the Civil Rights Movement in this effort. For the souls of those who suffered so bravely and with such nobility, it is the very least that can be done. In the meantime, we do well by calling these people out for what they are: usurpers and worse.